Aim: The aim of this research is to examine the viewpoints of the primary health care workers in Turkey regarding directing the patients to the emergency service by providing them with telephone consultancy (TC). Methods: In this cross-sectional study, the universe of the research is composed of the primary health care workers in Turkey. The online questionnaire technique was used to obtain the data. SPSS 15.0 statistical package was used in data analysis and p< 0.05 is considered significant. Results: 1083 healthcare worker participated in the study. The proposal of "I support the TC project" is a statistically significant difference in terms of profession, and it was found out that family health employees looked more positively at this project than the doctors (p=0,028). The total proportion of the health professionals supporting the project was found out to be as low as 17.4%. A statistically significant difference was determined between ages (p=0,005), gender (p=0,005), profession (p=0,000) and years of professional experience (p=0,000) with the proposal of “TC is a populist approach”. The proposal of "TC service reduces the intensity in the emergency service" in term of the profession, the statistical difference was found significant (p=0,023). Compared with family health employees; it was determined that the physicians did not think TC would reduce urgent applications. 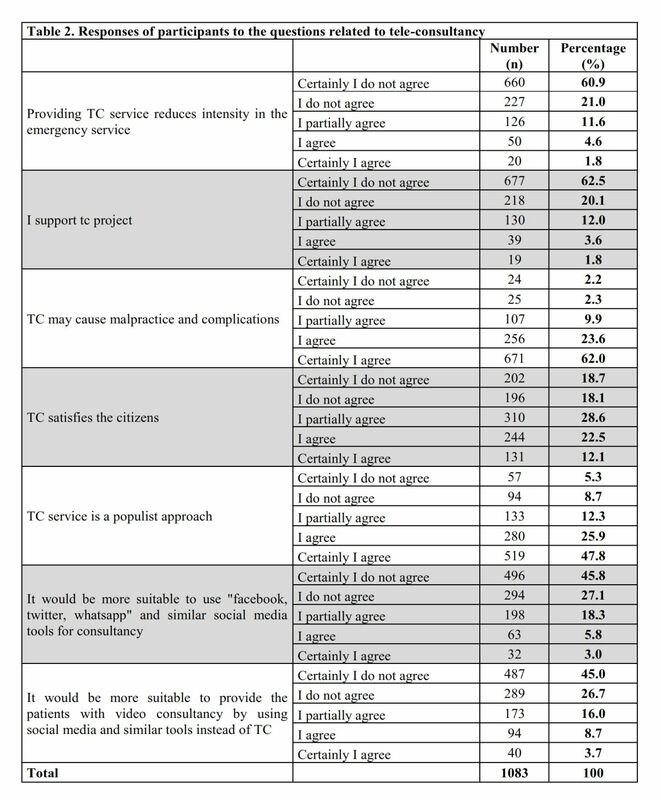 Conclusion: In Turkey, the primary healthcare workers mostly oppose the TC issue. As the professional experience increase, this rate increases much more. Giriş: Bu araştırmanın amacı, Türkiye’de aile hekimliği çalışanlarının hastalara telefon danışmanlığı (TD) hizmeti vererek acil servise yönlendirme konusundaki bakış açılarını incelemektir. Yöntem: Kesitsel tipteki bu çalışmada, araştırmanın evrenini Türkiye’de birinci basamak sağlık çalışanları oluşturmaktadır. Verilerin elde edilmesinde online anket tekniği kullanılmıştır. İstatistiksel analizde SPSS.15.0 paket programı kullanıldı ve p<0.05 istatistiksel olarak anlamlı kabul edildi. Bulgular: Çalışmaya 1083 sağlık çalışanı katıldı. “TD projesini destekliyorum” önermesi meslek açısından istatistiksel olarak anlamlı olup; aile sağlığı elemanlarının hekimlere göre bu projeye daha olumlu baktığı tespit edildi (p=0,028). Projeyi destekleyen sağlık profesyonellerinin toplam oranı %17.4 olarak düşük tespit edilmiştir. “TD popülist bir yaklaşımdır” önermesi ile yaş (p=0,005), cinsiyet (p=0,005), meslek (p=0,000) ve mesleki deneyim yılı (p=0,000) arasında istatistiksel olarak anlamlı bir fark saptandı. “TD hizmeti vermek acil servisteki yoğunluğu azaltır” önermesi ile meslek açısından istatistiksel fark anlamlı bulundu (p=0,023). Hekimler aile sağlığı elemanları ile karşılaştırıldığında TD’nin acil başvurularını azaltacağını düşünmediği tespit edildi. Sonuç: Türkiye’de aile hekimliği çalışanları TD konusuna büyük oranda karşı çıkmaktadır. Mesleki deneyim arttıkça bu oran da artmaktadır. In Turkey, the Ministry of Health has announced that it plans to reduce the number of unnecessary applications to the emergency services by giving a telephone consultancy (TC) watch to the family physicians by means of a structure similar to 112 command center.5 It is, of course, important to develop new models to reduce the burden of the emergency services. However, this will be more effective, if it is performed in the context of scientific studies and data. The aim of this research is to examine the perspectives and approaches of the primary health care workers in Turkey regarding directing the patients to the emergency service by providing them with TC service and to present some evaluation results in this respect. 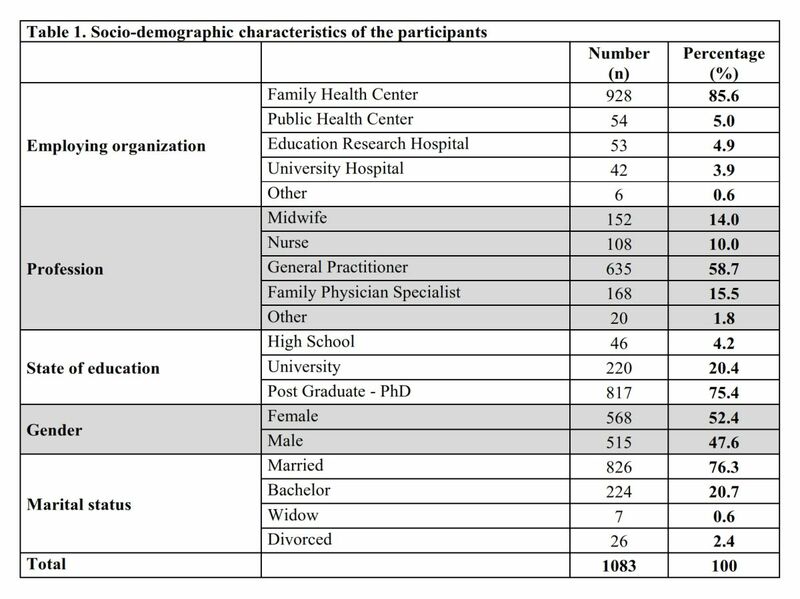 In this cross-sectional study, the universe of the research is composed of the doctors, family health employees (nurses, midwives etc) (FHE) working in the family practice in Turkey, assistants, and instructors in family physician department of the medical faculty. If it is necessary to define doctors; they are general practitioners working in the family health center, primary health care workers. FHE; they are working in the family health center and give preventive care as vaccination or contribute to patient education under the leadership of family physician. The assistants are doctors who are having specialist training in family medicine after graduating from medical school. Instructors in family physician department of medical faculty; these are trainers who provide training for assistants in family medicine specialty training. 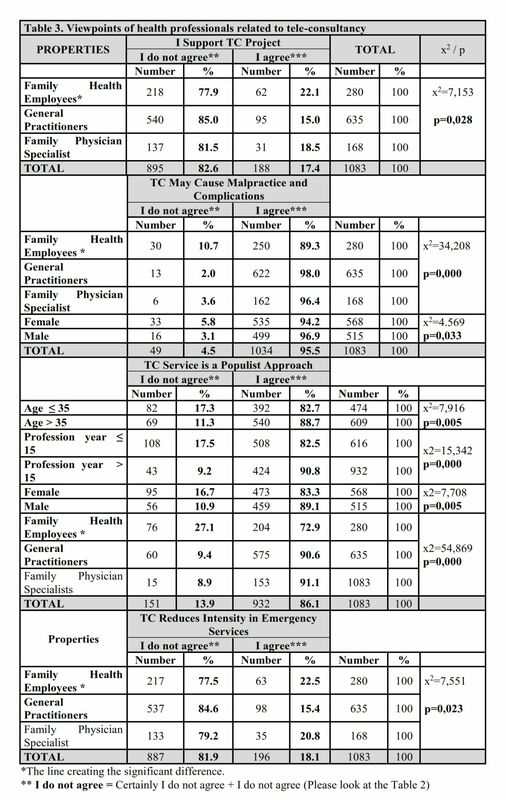 According to the data of the Ministry of Health in Turkey, there are 21696 family physicians and the same number of FHEs.6 When family physician assistants and instructors working in medical faculties and educational research hospitals are added, a target audience of about 50 thousand people in total can be mentioned. The number of samples that should be reached from the universe size table with the 95% confidence interval and 0.03 sample error was calculated as 1045.7 This number is our minimum target but we reached 1083 person. The online questionnaire technique was used to obtain the data. After the literature search, a questionnaire form was prepared, after it was applied to the pilot group of 40 people, the necessary arrangements were made and applied. The participants of the questionnaire were asked questions related to the TC by using the socio-demographic in data the first part and the 5-likert scale in the second part. The target group was reached by random sampling method via e-mail, smartphone, and social media. Especially, the online questionnaire form shared in the email group of Family Physicians Federation (AHEF) and Turkey Associations of Family Physicians (TAHUD) and had tried to reach the target audience. Ethically, the participants were informed about the aims of the study and they were asked if they would like to volunteer for participation. They were also informed that they could withdraw from the study at any time and that all information would be kept strictly confidential. All of the data were collected in March 2017 in a one-month period. The data obtained in the study were presented with frequency, percentage, mean ± standard deviation (SD) and categorical variables, number and percentage (%) using the SPSS 15.0 package program. The relations between the dependent and independent variables were examined with the cross tables (Chi-square=χ2). The p<0.05 was considered significant in determining whether there was a statistically significant relationship between the variables. 1083 health professionals participated in our study. The mean age of the participants was 38.29±9.19 (min:20, max:65) and the mean of the professional experience year was 14.17±8.99 (min:1, max:37). Other socio-demographic characteristics have been presented in table 1. To the question of "Which one of the following would you prefer if you have to make a choice for the purpose of communicating with your patients apart from a face-to-face interview and ensure them to get into contact with you?” 32.0% (n=347) informed that they would prefer to provide consultancy by telephone and 24.3% (n=263) by personal internet site and 23.2% (n=251) by video interview and 20.5% (n=222) by social media tools. The viewpoints of the health professionals regarding the TC have been summarized in table 2. Our study was participated by attendance from 73 provinces in Turkey. The 8 provinces without participation in the questionnaire were found out to be Bitlis, Kırşehir, Nevşehir, Gümüşhane, Tunceli, Bayburt, Iğdır and Kilis. 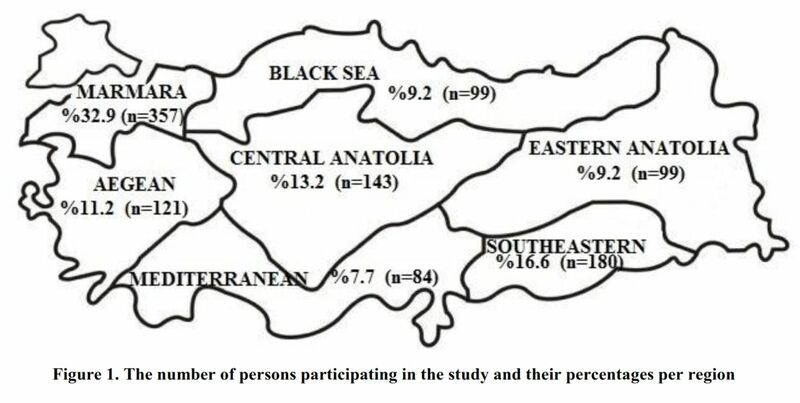 The provinces participating in the questionnaire were shown in figure 1 with the percentages of the seven geographical regions in Turkey. No statistically significant difference was determined by age, gender, years of professional experience and employing institution with the proposal of "I support the TC project". However, there is a statistically significant difference in terms of the profession; and it was found out that FHEs looked more positively at this project than the general practitioner and family medicine specialists (table 3). The total proportion of the health professionals supporting the project was found out to be as low as 17.4%. No statistically significant difference was determined between ages, gender, years of professional experience and employing institution with the proposal of "TC may cause malpractice and complications". However, there was a statistically significant difference determined in terms of occupation and gender (table 3). According to FHEs, it was found out that the physicians think that TC may cause malpractice and complications more. Males were found out to believe that malpractice may become more common than females. A statistically significant difference was determined between ages, gender, years of professional experience and employing institution with the proposal of “TC is a populist approach”. However, no statistically significant difference was determined between the employing institutions. It was found out that those who were older (age>35 years), those who had more professional experience (professional experience>15 years), the doctors and men other than the others thought that this is a populist approach (table 3). No statistically significant difference was determined between ages, gender, years of professional experience and employing institution with the proposal of "TC service reduces the intensity in the emergency service". However, in term of the profession, the statistical difference was found significant p=023. Compared with FHEs; it was determined that the physicians did not think TC would reduce urgent applications. Access of especially the elderly patients, who live on their own in the regions away from the health centers, to the health services constitutes an important problem. For these reasons, the use of telehealth and telenursing services has gained importance in recent years.8 Improvement, especially in the management of chronic diseases, can be achieved by means of TC. The TC has been found out to be generally successful in increasing medication compliance in people with hypertension and cardiovascular disease, in applying healthy diets and establishing lifestyle changes.9 Especially in the field of psycho-oncology, the telephone-based cancer information programs are reported to provide many benefits to the cancer patients. Through the planned, well-organized telephone interviews it can be provided that the patients take their own responsibilities in treatment and care for controlling the side effects of their illnesses, participate in the decisions made during the period of treatment and care, and enhance their quality of life to improve their compliance with disease, treatment, and care.10 It has been determined that providing diabetes training by phone is effective in diabetic patients receiving TC service.11 Again, telephone nursing consultancy was provided for providing medicine compliance of the ulcerative colitis patients and it was determined that the patients' compliance with medicine use increased longer than expected in 6-month telephone interviews.12 In the study called the effect of monitoring the patients applied hip prosthesis at home via telephone; it was stated that monitoring patient via telephone is effective in monitoring post-discharge patients applied hip prosthesis and it was suggested that it can be used in the other fields, too.13 The persons, who wanted nutrition and exercise consultancy, were given a computer-controlled TC for 6 months and at the end of the 6th month, the participants were asked to rate this consultation between 0-100; according to this scale, those who found the system useful scored 63.6% and those satisfied with the system scored 62.3%.14 In our study, 63.2% of the health professionals reported that the citizens would be satisfied with the proposal of "TC satisfies the citizens". The rate of those, who think that such a practice is a populist approach, is 86.0%. While a direct proportion is normally expected between the patient satisfaction and populist approach thought, here we got an inverse proportion. It should not be forgotten that the patient satisfaction shall not medically have the same meaning with the correct approach. *The line creating the significant difference. It should not be forgotten that we have a family practice application that is adapted to Turkey and has its own characteristics. In Turkey, there is no obligation for the referral chain and appointment system in the application of family practice. All services are free in the primary health care, and almost all of the health payments of the citizens in the second and third stage healthcare are under the state guarantee within the scope of General Health Insurance. Since access to health services is now very easy and free, unnecessary applications and congestions are sometimes inevitable. In Turkey, the drawbacks of using TC for patient triage and orientation to the emergency services are obvious. Moreover, it clear that TC is unlikely to reduce the unnecessary applications especially to the emergency services. In order to achieve this, it will be more effective to take deterrence measures such as premiums and contributions as in the foreign samples. However, TC can be effectively used to regulate chronic disease management, monitoring, and maintenance treatments by the family physicians. There is also a need for the legal arrangements to share and authorize the responsibility of the physician. In the last few years, the family physicians in Turkey have been assigned to watch at night and weekends in the emergency services and this application was given up as it did not provide the expected productivity in practice. Later on, watch duties were given on the weekends in family health centers, this was also given up. Now, something new is being tried. However, in the field research that we carried out, the primary healthcare workers mostly oppose the TC issue. As the professional experience increase, this rate increases much more. Therefore, the field's pulse must be well analyzed by means of the scientific methods before a legal step is taken in this respect. The experience of the health professionals must be benefited. Applications that will result in a possible failure again should be avoided. Because since the health literacy is low in Turkey, TC will not satisfy the citizens and will not prevent the unnecessary applications to the emergency services. Even in countries abroad, where the levels of health literacy and education are high, TC is used in the follow-up of the chronic patients and is not used to reduce the emergency applications. The results of the research reflect the perceptions of the healthcare professionals participating in the questionnaire about the orientation of the patients to the emergency service by means of TC. The individuals, who did not participate in the questionnaire, gave up answering the questions by breaking short and do not actively use the online (mail and social media) technologies were left out. Therefore their views were not reached. The reliability and validity of the data obtained by the questionnaire are limited to the characteristics of this technique used in the data collection. The fact that the research data has been collected by the online questionnaire method and the lack of face-to-face interview technique is another limitation of the study. We thank to all physicians and family practice colleagues, who supported our study, and to Dr. Mehtap ASLAN, the 2nd president of the board of directors of AHEF. Koçak A, Bulduklu Y. Health communication: The viewing motivations of health programs on television by elder people. Selçuk İletişim 2010:6(3);5-17. Öz F. Bassis concepts in field of health. Nursing. 2nd edition, Ankara: Mattek typography, 2010:44-8. Ertek S. Tele-Medicine and tele- health use in endocrinology practice. Acıbadem Üniversitesi Sağlık Bilimleri Dergisi 2011;2:126-30. Switzerland health guide. http://www.migesplus.ch/fileadmin/Publikationen/ tur_GWW_web_1_.pdf. Accessed 05.09.2017. The minister of health Mr Akdağ participated in Anadolu Agency table of Editor Program. http://www.saglik.gov.tr/TR,13184/bakan-akdag-aa-editor-masasina-konuk-oldu.html. Accessed 05.04.2017. Republic of Turkey the Ministry of Health’s Statistical yearbook of 2015. 143 http://www.saglikistatistikleri.gov.tr/dosyalar/SIY_2015.pdf Accessed: 05.10.2017. Yazıcıoğlu, Y. and Erdoğan, S. SPSS applied scientific research methods. Ankara: Detay publishing. 2004,50. Han HR, Kim J, Kim KB, Jeong S, Levine D, Li C et al. Implementation and success of nurse telephone counseling in linguistically isolated Korean American patients with high blood pressure. Patient Educ Couns 2010;80:130-4. Marcus AC, Garrett KM, Kulchak-Rahm A, Barnes D, Dortch W, Juno S. Telephone counseling in psychosocial oncology: a report from the Cancer Information and Counseling Line. Patient Educ Couns 2002;46:267-75. Acemoğlu H, Ertem M, Bahçeci M ve Tuzcu A. Levels of health care utilization in patients with type 2 diabetes mellitus. EAJM 2006;38:89-95. Cook PF, Emiliozzi S, El-Hajj D, McCabe MM. Telephone nurse counseling form education adherence in ulcerative colitis: A preliminary study. Patient Educ Couns 2010;81:182-6. Bilik Ö. Effects of observing hip prosthesis applied patients with telephone to the recovery. (Doctorate thesis) İzmir: Ege University Health Sciences Institute; 2006; 240. Glanz K, Shigaki D, Farzanfar R, Pinto B, Kaplan B, Friedman RH. Participant reactions to a computerized telephone system for nutrition and exercise counseling. Patient Educ Couns 2003;49:157-63. Lorentz MM. Tele-nursing and home healthcare the many facet of technology. Home Healthc Nurse 2008;26:237-43. Valanis B, Tanner C, Moscato SR, Shapiro S, Izumi S, David M et al. A model for examining predictors of outcomes of telephone nursing advice. J Nurs Admin 2003;33:91-5. Foels T, Terranova MD, Melzer SM. After-hours telephone triage: reducing the financial burden- reply. Arch Pediatr Adolesc Med 2004:158-86.